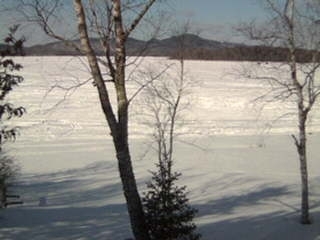 This is a snapshot from our webcam overlooking Big Wood lake [u]last year[/u] on this date. The ice out date for 2013 was on May 1st. I am not posting a cam shot from today because all you can see now is TOTAL white…everywhere. 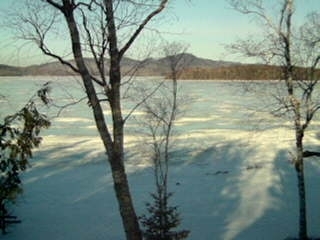 Our fisherman we had this past weekend said that the ice was still about 3 feet thick. Temperatures are running mid 20-s to mid 30s. So when do you think ICE OUT be this year? Deadline to cast your vote this year is 8am on April 15th. The winning date will be what the Town of Jackman records as the ice out date for 2014. 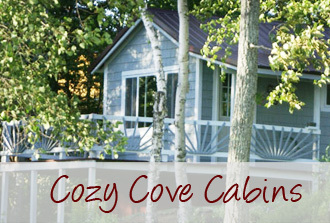 Whomever chooses that date, will win 50% off one night when they stay with us 2 or more days. This offer will expire March 31, 2015. So far today we got another 4 inches and it is still snowing. I have nothing more to say. I just liked this picture I took today. Spring….isn-t that when the rains fall and flowers bloom? Not in Jackman. 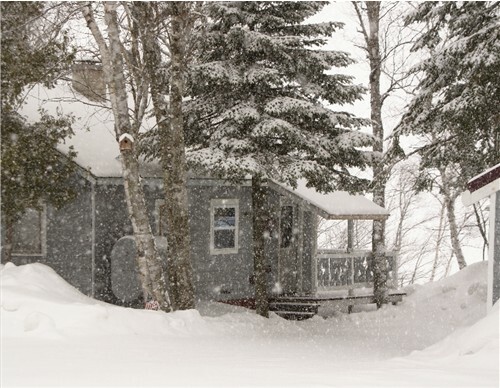 We got about 3-4 inches of snow last night and as you can see, it is snowing pretty hard right now. Looks like another inch in just an hour. Oh well. It is what is is. If you are coming up this weekend to play on our trails, you should have some great riding. See you soon. 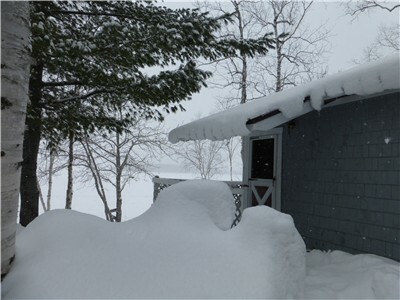 With all that new snow last week, our you snowmobilers could ride well into April here in Jackman. The Border Riders Club are still grooming and say they will as long as they can ride. We had one warm day over the weekend but otherwise, BRRR it has been cold so the trail should be setting up nice every night. Our riders this week said there were a few areas toward Pittston Farm that were a little washboard like but all in all, everywhere they went, (north into Canada, south to Parlin and East to Pittston Farm, trails were awesome. SO to give you an individual trail report at this point is not necessary. Good riding throughout the region. A sunny day to celebrate St Pats Day but do not let it fool you. It is 3 degrees out there with a wind chill of minus 2.